PATENT INFORMATION: PATENT ABSTRACTS - WHAT ARE THEY AND WHY? 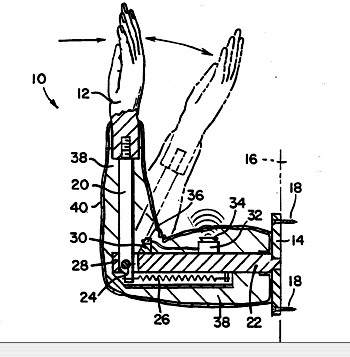 Let’s continue with some more patent information. 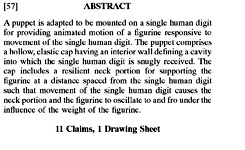 On the top page of every patent there is a small paragraph that is called an Abstract. Along with it, further down the page, is one of the drawings of the invention so that you maybe can see what the Abstract is talking about. 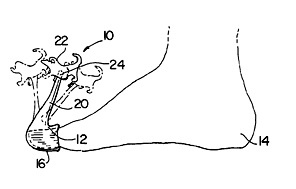 This patent information is for the reader to give them a hint as to what to look for in the patent itself. The patent abstract is to simply explain what the patent is for. Now, if you are a lay person, meaning you don’t know what the --- is going on, even the patent information in the Abstract is still going to confuse you. You see, the Abstract is written by the same one who wrote the Specification and Claims - the meat of the patent. In other words, this patent information is written in “Patentese,” which is very similar to Chinese to the lay person. I have warned you before about “Patentese” and how you should find someone who speaks it to write and file your patent application. That person, to do it right, is a Registered Patent Attorney. There, I’ve said it again. Anyway, to give you some further patent information, I am going to show you some selected patent abstracts and interpret them for you to show you what some of the “Patentese” language is talking about. I chose for this some of the abstracts from the Wacky Inventions which are on another page of this site. IN OTHER WORDS - There is this plastic cap thingy that fits over the big toe. there is a neck thingy that sticks up from the cap and there is a figure of some sort on top of that. the neck thingy is long enough so that when the big toe is moved the figure moves forward and back because of the weight of the figure’s body. Now you see why you need a patent attorney. 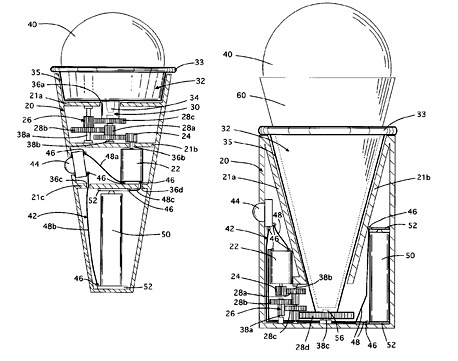 IN OTHER WORDS - This thingy cup that you put ice cream into is rotated by a drive thingy so that when you stick out your tongue, the drive thingy feeds the ice cream to your tongue so you can either eat the ice cream or make an ice cream sculpture (with your tongue). IN OTHER WORDS - If you are REALLY lonely - we have this hand and arm thingy that attaches to the wall and you can practice and/or receive “high fives” to your hearts content - without the need or bother of relating to other people. I don’t know what to say about this one. What’s the point? This is an off-handed, attempted humorous look at patent abstracts to show you how they are formed and the language they use - which is very different from real life - and for which you need an interpreter and speaker of the language to succeed. Patent information that you should heed to enable you to get your own patent.